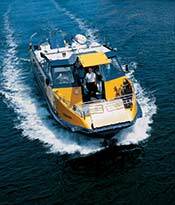 ABOVE: Use the Copenhagen Harbor Bus for an inexpensive do-it-yourself sightseeing cruise. Copenhagen's most famous statue is an obsession for tourists--and also for vandals who have decapitated or otherwise damaged the "small and unimposing" bronze sculpture over the years. Copenhagen's downtown amusement park has been a magical place for Danes and foreigners of all ages since 1843. Rides, entertainment venues, and restaurants are tucked amid flowers, trees, and thousands of lights after sunset. The world's oldest amusement park, Dyrehavsbakken, has a 90-foot (30m) wooden roller coaster with a brakeman, a flume and other thrill rides, beer tents, restaurants, circus and vaudeville acts, and deer that wander in from the surrounding Royal Deer Park. Most of the park's annual 2.5 million guests are Danish. Book city tours and regional day excursions online before you leave home. You can pay in euros, British pounds, or U.S. or Australian dollars. Photo copyright © Visit Copenhagen.